I am amused with the notion that technical information presented in a blog, book, article, or any other form can remain relatively current long past its publication date. This certainly was the case when I started writing books in the early 1990s, but cloud services have changed things utterly. In particular, the text of many technical blog posts (especially about Office 365) are now like dead fish or visitors: they begin to age and smell after three days. Take a blog post I published on the ITUnity.com web site in August 2016 (ITUnity is currently undergoing a transformation, hence no link). The topic was how to use PowerShell to find obsolete Office 365 Groups by looking for evidence of little or no activity in the groups. Basically, the code checks the group mailbox to find the date of the last conversation item, the group document library to see if it exists (i..e. someone has caused SharePoint Online to create the library), and if the library exists, to look for evidence of recent activity. I combined the checks together into a script which generates a nice HTML report and published the script in the TechNet gallery. All was well. Then someone asked about the Office 365 Group expiration policy in the Microsoft technical community. The expiration policy works on the basis that a group expires after a certain period and then needs to be renewed by its owner (see this write-up for details). Various notification messages are generated for this purpose, and the feeling expressed was that these messages look like spam and should be customizable by tenants. I agree. It would be much better if tenants could apply their own look-and-feel to any notification going to users. In any case, my bright idea was to use the script I had written in August 2016 as the basis for a solution. It would be easy to add some code to generate email to the owners of the groups found to be obsolete, so that’s what I suggested. But then I found that ITUnity.com is currently offline. No problem, because I have copies of all articles in a SharePoint document library. Then I realized that the text written some sixteen months ago had aged horribly and needed to be refreshed – and the script needed some updates too. The availability of the group expiration policy is one factor (warning, the policy is a premium feature that creates the need for Azure Active Directory premium licenses), but the general availability of Microsoft Teams from March 2017 was the biggest influence. Every team has an Office 365 Group, but the activity of the team might be entirely based on personal and channel-based chats, and the checks for obsolescence that I created did not handle Teams. So I am rewriting the article and script to take account of the relevant changes that have happened inside Office 365. Expect to see the new text appear on Petri.com soon. That is, after I finish up some other articles that are occupying my attention at present. All of which brings me to the amount of change that we continue to see inside Office 365 (according to Microsoft speakers at the Ignite conference, they make between 300 and 400 changes in a calendar year). This rate of change is a challenge for tenant administrators, who need to understand what is changing and how it affects their users. It’s also a huge challenge for anyone who writes about Office 365. Take the Office 365 for IT Pros (4th edition) eBook. We published this edition on 1 June 2017. Since then, we have released 28 updates on a roughly weekly basis (see our change log for details). Even so, we barely keep pace with change. Table 1 is helpful because it shows where a lot of change has happened. Some of our updates are corrections, some occur because we learn more about a topic or gain an insight from various sources, but most are because Microsoft has changed something. From the table, we see lots of changes in Chapter 1 (introduction), dealing with things like new Office 365 datacenters, multi-geo support, new numbers for active users, new apps available to Office 365 plans, and so on. We also see lots of changes in Chapter 3 reflecting the transformation that is ongoing for SharePoint Online and OneDrive for Business. But the really big areas of change are around Office 365 Groups (Chapters 14 and 15), Teams (16), and compliance (18 and 19). Teams changes weekly (or so it seems). We constantly refresh text and graphics to reflect changes in the UI that are pushed out to users through automatic updates. Ignite 2017 was the first time that Microsoft spoke about Teams at a major conference, so lots of information was gathered there, digested, and then incorporated. We have added over 50% more material about Teams since the 4th edition appeared. Microsoft is also changing the Office 365 data governance framework with classification labels, event-driven retention, manual disposition, and so on. We see lots of changes in the Security and Compliance center that drives book updates. Change won’t stop and we won’t stop updating the book. The transition from Skype for Business Online to Teams is an example of change that is happening now that we need to document as it happens. More will happen inside Exchange, SharePoint, OneDrive for Business, Groups, Yammer, Planner, etc. etc. Some changes will be deep and detailed; some will be minor and involve just a few words. In all cases, we need to track, understand, and deal with the changes. Doing so keeps the writing team busy. But hey, what else would we do? 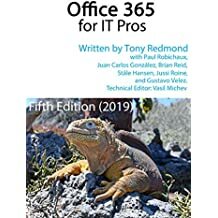 This entry was posted in Exchange Online, Microsoft Teams, Office 365, Office 365 Groups, SharePoint, Technology and tagged Exchange Online, Microsoft Teams, Office 365, Office 365 eBook, Office 365 for IT Pros, Office 365 Groups, SharePoint Online. Bookmark the permalink.